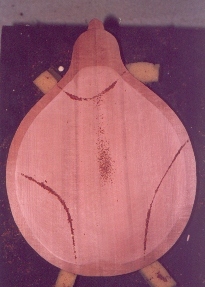 Modern mandolin construction is similar to violins in that the belly and the back of the instrument is carved. This method of construction for mandolins was pioneered by Orville Gibson late in the 19th century and further developed by the Gibson Company in the early 20th century. F5 Gibson mandolins manufactured in the 1920's and signed by Loyd Loar are considered by many to be the finest mandolins ever made. Although the construction of the modern Gibson style of mandolin is similar to a violin there are some important differences. The most obvious is the different shape. The instrument is plucked rather than bowed, which changes some of the desirable acoustic characteristics, and the other important difference is there is no soundpost. There are 8 steel strings rather than 4, so the instrument needs to be constructed strong enough to withstand the greater string pressure. Also, a mandolin is unlike a violin in that the top (or even the back) can be braced in any way you like so long as the bracing adds enough additional strength to prevent the instrument from collapsing under the pressure of the strings. 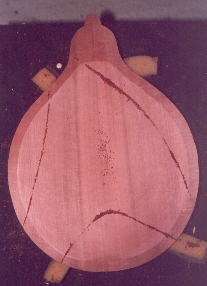 In mandolins with an oval soundhole, Gibson used a single cross brace placed just behind the soundhole. In instruments with F soundholes, Gibson used two longitudinal braces which went under the feet of the bridge. After much experimentation I have settled on an X brace, although that is not necessarily the ideal bracing method for all tonal characteristics demanded by musicians. Acoustics of violins and the violin family of instruments has been relatively well researched. Since one could described a mandolin as an 8 stringed violin (without a soundpost) that you pluck rather than bow, at least some of this research should be relevant to mandolins. I have spent a lot of time developing a method of tap tuning, but tap tuning is an imprecise method and requires a lot of experience to master. However, tap tuning does give useful information to an experienced Luthier. The absolute frequencies indicate the strength to weight ratio and the sound of the tap tone gives information about overtones and internal damping (Q factor). If you make enough instruments, just on a probability basis you are bound to make some outstanding sounding instruments. The big difficulty is to understand why those outstanding instruments sound outstanding and to be able to repeat that process consistently. This was the driving force behind the research on violins, and is the driving force behind the results in this paper. 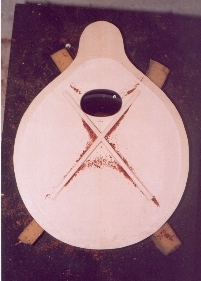 The other driving force was to use a technique that could be useful and could be used by a Luthier with limited resources. 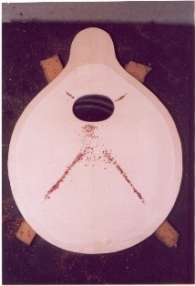 Laser interferometry is a much more sensitive method of measuring modal patterns, but this technique is not practical for the average Luthier. What follows is my experience on free plate tuning of mandolins, and as far as I am aware, is the first time anything of this nature has been published on mandolins. Cohen and Rossing (2000 and 2003) have published pioneering papers on normal modes of vibration in assembled mandolins, and I would urge anyone interested in mandolins to read these papers. This report is based on my experience of building approximately 70 mandolins over a period of some 7 years. It is certainly not the end of the story. At this stage it is important to point out that the techniques described in this paper are only a tool that can be used to tune the free plates of a mandolin. The tone of a mandolin depends on many factors, some of which will have a much bigger influence on tone than plate tuning. Other factors that can affect the tone of a mandolin are species of wood, arching, graduation, bridge, tailpiece, strings, varnish, neck and of course other acoustic resonances not measured by free plate tuning. Free plate tuning has a somewhat controversial history, and I certainly do not pretend that on it�s own the technique will produce great sounding instruments. In fact I often advise beginners to forget about tap tuning or Chladni plate tuning and concentrate on other things such as getting the arch and gradations right, and after having built a few instrument then think about it. This is likely to have a bigger influence on the sound of the resulting instrument than concentrating on plate tuning or tap tones. Just build to the dimensions and listen and note. However, once arching and graduations have been mastered, I have found plate tuning to be very useful in helping to maintain consistency. If I make a mandolin from the same timbers and tune the plates to identical frequencies, the resulting instrument will sound near enough to identical. A musical instrument is the sum of all it's parts so a Luthier has to consider the effects of everything that goes into the construction of the instrument. However, add up a lot of small improvements and you end up with a big improvement. It has taken a large amount of my time to get to the stage where I can start to predict some things about tone from the way the free plates have been tuned. Wood is a highly variable material and often does not do what you want it to do, so the process can be frustrating at times. If one scans the discussion groups on the Internet, it would appear that mandolin makers are obsessed with gradations, whereas violin makers are more concerned with arching. My experience tells me that arching is very important in mandolins as is the species of timber (see Coombe 1996, 1999, and Bourgeois 1994 for guitars), and the bridge design and material can also profoundly affect tone as well (Coombe 2003). Plate tuning is only a small part of the whole picture. I do not intend to give a detailed description of the techniques. This information can be obtained from other sources (e.g. Hutchins 1981, 1983, Carruth 1992). Alan Carruth's (1992) excellent paper on violins and guitars has been published in the Big Red Book of American Lutherie Volume 3 (available from the GAL) so is now readily accessible. A mandolin free plate (i.e. carved top or back) is placed over a speaker with the concave (i.e. inner) surface facing upwards. Four blocks of foam support the plate. The plate is then sprinkled with sawdust and a sine wave applied to the speaker. Christmas glitter is the usual method of measuring Chladni patterns rather than sawdust, and it does give more precise patterns, but glitter is difficult to remove completely. I chose to use Jarrah sawdust since it doesn't matter if there is a bit extra of sawdust in the workshop, and Jarrah is more visible on Spruce bellies. Glitter is horrible stuff because it tends to stick to everything, and the last thing I need is a piece of glitter stuck under a varnish finish. The speaker is a 120 Watt high power 8 ohm woofer, the amplifier a 140 Watt Hi Fi power amplifier driven by a digital sine wave generator. All electronics were purchased from Jaycar as kits and built by the author. The total investment necessary was about $900. Sound levels necessary to generate the patterns are quite high so ear protection is absolutely essential. It is important to store the plates before measuring the Chladni patterns together. Changes in relative humidity will change the modal frequencies (Hutchins 1982, Thompson 1979), so ideally the free plates should be stored at a constant relative humidity and tested at the same humidity at the same time. As in violins and guitars, there are a large number of Chladni patterns (i.e. modes) that can be measured, and there are quite significant variations between individual plates. Also, not all modes may be measurable on a particular plate. However, there are usually 4 modes that can be measured which I have named Mode 1,2,3 & 4. These are illustrated in Figure 1. These 4 modes can be clearly heard as tap tones, and Figure 1 illustrates how one can listen to the tap tones. If the plate is held in position A and tapped in position B, one can hear the mode as a tap tone. Mode 2 is often difficult or impossible to measure as a Chladni pattern, and over time I have stopped trying to measure it since I believe it is unimportant to the final tone of the instrument. Modes 1 and 2 are more often than not very close together in frequency, and in this case mode 1 will dominate and mode 2 disappears in the Chladni plate measurements. Mode 4 is usually, although not always, the strongest mode as measured by how much the sawdust dances on the plate. Comparing these patterns to what has been measured in Violins and Guitars, it is clear that mandolin mode 1 corresponds to mode 2 in Violins and Guitars (the "X" mode, the first bending mode), mandolin mode 2 corresponds to mode 1 (a twisting mode) in violins and guitars, and mode 4 is the so called "ring" mode. Mandolin mode 4 is very similar to the open ring mode that has been measured in classical guitars (Carruth 1992). Mandolin modes 1 and 2 can be very close in frequency or sometimes they are reversed, with mode 1 at a higher frequency than mode 2 as is observed in violin and guitars. I have called the "X mode", mode 1 because it is always the lowest frequency on an X braced mandolin top, and is often the lower frequency in backs. I have only ever measured a closed ring pattern on one mandolin back that I eventually decided was not suitable for a mandolin because of wild figure and excessive runout. In every other case, mode 4 was the open ring pattern, and without exception was easily measured. There are other modes that can be measured at higher frequencies, but these are almost invariably multiples of these 4 modes, so normally I do not measure anything beyond mode 4. In any case, my speaker starts to drop off in frequency response after about 2 KHz. 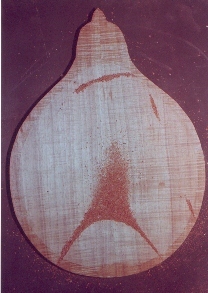 Figure 1 is not typically what occurs in real wooden mandolin free plates. It is meant to be a guide to identify the modes rather than an indication of what you are likely to see when measuring carved mandolin plates. 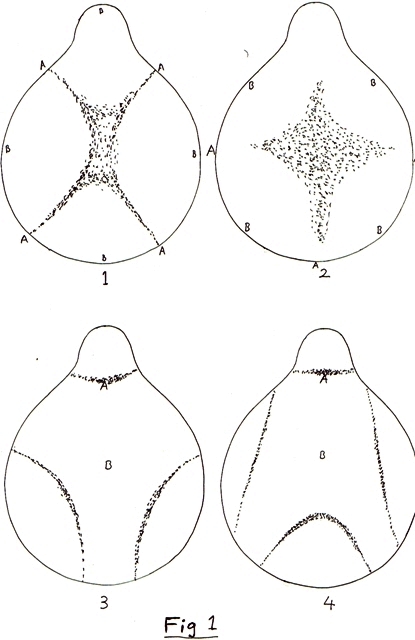 Figure 2 shows some real Chladni patterns of Coombe mandolin #95. The shape of the patterns will change depending on the physical characteristics of the wood, so are not always symmetrical as shown in the Figure 1. Wood that is perfectly quarter sawn, free of knots and perfectly straight grained, and carved perfectly symmetrical, is more likely to produce patterns similar to Figure 1. This seldom happens. For example, King Billy Pine is particularly problematic because the quality of the wood varies so much. Embedded small knots is very common, and it is difficult to get wood that is perfectly quarter sawn. However, the instruments sound great, so it is not necessary to have perfectly symmetrical Chladni patterns for good sounding instruments. Mandolin #95 is one of the best sounding oval soundhole mandolins I have made, so Fig 2 is a good guide what to aim for. Very recently I have made another mandolin from the same woods and tuned almost identical to #95 and the resulting tone of this instrument is near enough identical to #95. 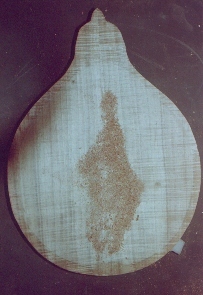 Fig 3 is a Blackwood back from an earlier mandolin made some years ago (#34) and I have included it because it shows all 4 modes. Nowadays I would consider it to be rather poorly tuned. 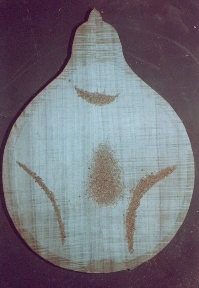 Figure 2: Free plate Chladni patterns measured for mandolin #95. Top is European Spruce, back is Tasmanian Myrtle. So now we have the modes, how can we use them? This is the big question, and I don't pretend I know the complete answer, and will not go into great detail in this paper, but I can give some clues based on my experience to date. This is a continuing project, and I learn something new from every instrument, so this paper has been a long time coming and there will be others as I gather more information. I have mostly used free plate tuning to improve consistency from instrument to instrument. Once a combination has been found that sounds good then that can be repeated in another mandolin and the two instruments should sound very similar if made from the same woods. In practice I have indeed found this to be the case, with mandolins made from identical woods and tuned the same sounding near enough to identical. Unfortunately wood is not consistent, so usually the tunings are not the same, even if the wood comes from the same trees, and the resulting instruments all sound different. It is a real challenge to make instruments that sound near enough to identical, but I have achieved this on a limited number of occasions. A good place to start is the data available from the violin research. If one could use this as a starting point, then we may have some clue how to use the mandolin modes. Firstly, it is impossible to do double octave tuning in mandolins. Modes 1 and 2 are usually quite close together and I have never observed a difference of anything like an octave. It is possible, however to have modes 1 and 4 an octave apart, and it is also possible to match modes 1 and 4 in the top and back. However, from about 70 mandolins I have only ever been able to match modes 1 and 4 in the back and top and also to have modes 1 and 4 an octave apart in 2 instruments. 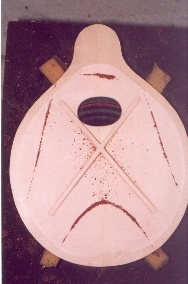 These were both oval hole mandolins, King Billy Pine top and Blackwood backs. I have never managed this combination with a Spruce topped instrument. Both of these 2 mandolins were truly exceptional sounding instruments, so at least this does indicate that the principles are similar in mandolins and violins. It is not all that uncommon to find F hole mandolin tops with modes 1 and 4 an octave apart, but it is very difficult to find a matching back. The backs are invariably tuned higher, and cannot be tuned any lower without risking structural failure. The obvious thing to do then is to tune the back and top in F hole mandolins an interval of 1/5th apart. I have tried this and the resulting instruments had such a huge sustain and ring they were difficult to play. Usually in F hole mandolins I aim to tune mode 4 in the back 4 semitones above the top since it seems to make an instrument that sounds sweeter and the sustain is controllable. This is not always possible and in these cases you just do the best you can. More recent instruments have been tuned differently with very encouraging results, but it is still too early to make any sort of generalisation. Oval hole mandolins are much easier to match mode 4 in the top and back, because the top tunes higher than F hole tops (they are carved thicker), but once again this is not always possible and you just need to do the best you can. In my opinion, I do believe it does make a difference when these modes are matched, particularly if you can also get mode 1 close to matching as well. The resulting mandolin is louder and more responsive, and if the neck mode (see below) can also be matched to the soundbox resonance (A0), the instrument becomes extremely responsive, and with a long sustain. The soundbox of these mandolins will resonant audibly without the strings on just by moving it around in the air. A0 (sometimes called the "Helmholtz" mode, but Helmholtz resonators have rigid walls, whereas musical instrument soundboxes do not) is a function of the volume of air in the soundbox, the surface area of the soundholes, the thickness of the soundhole edges (small in mandolins), and the stiffness of the plates and ribs. Thus one can control the frequency of A0 by controlling the stiffness of the top and back so long as the other factors remain constant. More easily said than done! It is not necessary to match mode 1 if mode 4 is matched in mandolins. Mandolins certainly do not exhibit harsh gritty tone if mode 4 is matched, but mode 1 is not matched within 1.4% in frequency as occurs in violins. One can speculate that this may be due to the absence of a soundpost. The other observation I have made is that the better sounding instruments sometimes have a weaker mode 3. In some cases I cannot measure mode 3 at all. An X brace will tend to raise the frequency of mode 3 and lower the amplitude because it crosses the node line of mode 3. It may even be possible in rare cases to raise mode 3 enough so that it is the same frequency of mode 4. Tone bar bracing will also do this, but to a lesser extent. How else can we utilize Chladni patterns? Since mode 4 is probably the most important, as indicated from violin and guitar research, I try to maximise the amplitude of mode 4, and get the node lines as sharp as possible. The sawdust should dance the most where the bridge position is. Also, mandolins can be braced however you like. There is no bass bar as in violins and no hard and fast rule on bracing. Usually the top of F hole mandolins is braced with parallel tone bar bracing or an X brace and the back is unbraced, although there is no reason why the back cannot be braced. In fact I have braced the back in some of my mandolins to raise mode 1 without raising mode 4 too much and the resulting instruments sound fine. Indeed some sound exceptionally fine. Perhaps the biggest plus I have got from the huge amount of time I have invested in measuring Chladni patterns, was to change the way I was bracing the tops of my F hole mandolins. The logic of my decision to change the way they were braced was to position the braces in order to interfere with modes 1 and 4 as least as possible. The first mandolin braced in this manner sounded so much better than anything else I had made previously that I continue to use the modified X brace. If a completed mandolin is held at about the nut position and tapped at about the 12th fret position, one can hear a resonant mode. The nodes are at about the nut position and in front of the bridge. It is very likely this is the equivalent to the B0 mode in violins (Hutchins 1985). If the frequency of this "neck mode" is matched to A0, the resultant instrument is very likely to have a big sustain. This may or may not be a good thing, depending on how the Luthier wants the instrument to sound. In some cases the sustain is so huge, it is difficult for the player to control, so may not be desirable particularly in F soundhole mandolins. In oval hole mandolins, the instrument becomes more "vibrant" (to quote Hutchins 1992) if these two frequencies are matched. Just moving one of these mandolins around in the air without the strings on will cause the soundbox to resonate audibly. Unfortunately, there is very little that can be done to adjust this frequency, so it is to a large amount a matter of luck where this resonant frequency ends up. Shaving wood off the neck will lower it, but there is a definite limit to how much wood can be taken off before the neck starts to feel uncomfortable or becomes a structural risk. This phenomenon has been well documented in violins by Hutchins (1985, 1990), and Bissinger and Hutchins (1985). The main conclusion I have come to is that mandolins are similar but different from violins. They are also similar, but different from guitars. The assembled mandolin is more like a guitar (Cohen and Rossing 2000 and 2003). This of course comes as no surprise. The important thing to know is how are they different and how are they similar to violins or guitars, and to be able to use this information in the construction of the instrument. Listening to tap tones is basically the same as measuring Chladni patterns, except Chladni patterns are more precise and will give you more information in the spatial and frequency domain. However, it is important to still listen to tap tones. The important question to be answered is, are Chladni plate modal patterns useful? 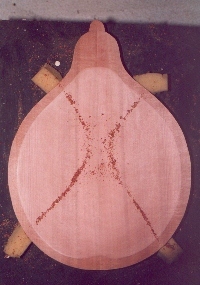 Once the ribs are glued to the plate, this fundamentally changes the stiffness of the plates and the model patterns will change. This will change again once the plates are incorporated into a finished instrument. The leap from free plate modes to a fully assembled instrument is a great leap. Wilkins (2001) has attempted to follow free plate modes from the free plates to an assembled violin, and Atwood (1996) has measured modes in free plates and plates clamped to a heavy frame around the edges. Unfortunately the mass of the wooden frame does affect the results so this is probably not a good method, as shown by Wilkins (2001) who glued the plates to ribs. The main conclusion made by Wilkins is that it is possible to follow free plate modes after the ribs are glued, but the ribs do affect the top and back modes differently so that the relative relationships change. Also, it is possible to find some links between free plate frequencies and those in finished violins, but the relationship is not simple. It has been argued by many that because assembly of the instrument changes the modal frequencies, that free plate tuning is not a very useful technique at all and is a waste of time. In fact Schleske (2000) found no correlation between the free plate eigenfrequencies and the corpus eigenfrequencies and questioned the meaning of free plate tuning. Unfortunately, there was no evaluation of the sound of the instrument being played in this study. Perhaps (or perhaps not) the conclusions may have been different if he had evaluated tonal qualities. I would be astonished if thinning the plates had absolutely no affect on the sound of the instrument as implied by this paper. I would argue that so long as the design of the instrument is consistent - i.e. same shape, same internal volume, same soundhole, same ribs and neck, same glue, same varnish, bridge etc, then the changes should also be consistent, and it does not matter that things do change when the instrument is assembled. Once a relationship is found that works, then so long as everything else is consistent then it should give similar results in the next instrument that has the same relationships in the free plates. The method is impirical, and basically is what most Luthiers do anyway but by using different techniques. Everyone tries to repeat that fluke instrument that sounds fantastic, but usually one does not know why it sounds fantastic. By measuring as many things as you can as each instrument is built, there is a much better chance of being able to repeat that fantastic sounding instrument. I have done it, but it is not necessarily because of something I discovered using free plate tuning! One example is with arching. I now make my mandolins with a higher arch because they seem to sound better with the arch higher than in my earlier instruments. This has the effect of raising the frequencies of the free plates, which may or may not be a good thing. Now I know I can consistently predict the likely frequency of A0 in my mandolins from the Chladni plate modes I measure in the free plates. The frequency of A0 does have a very significant influence on the tone of a mandolin (this I will attempt to address in another paper), so I can to some extent predict the likely effects the measured modal frequencies will have on the tone of the instrument and can aim for something I know will produce the required effect. Unfortunately it is not all that easy, because wood is such a variable material, so in practice one aims to stay in a certain envelope and to make adjustments in other areas (e.g. bracing) to compensate. It is certainly possible to make very fine sounding instruments without resorting to free plate tuning, whether that be via tap tuning, Chladni plate tuning, laser interferometry or FFT. It is still very important to use the usual techniques of flexing the plates in one's hand, looking and feeling the arch and thicknesses, listening and tapping etc, even if you are doing some measurements, but measurements may just give you that little bit of additional information that gives you that idea that results in a better sounding instrument. It has certainly worked for me. Instruments that come back for refrets occasionally have proven that significant progress has been made. Now whether that is directly due to free plate tuning is a debatable point, but I think it has certainly helped. It unquestionably does help in maintaining better consistency. As with many things in musical instrument making, there is so much to do and learn and so little time. Many makers who have tried measuring free plate modes give up either because they don't understand what is happening, or believe that the technique is not useful, or it takes up too much time. As with many difficult techniques it is necessary to spend sufficient time on it before the benefits are realised. As already pointed out by Carruth (1992), it takes time and experience to really learn these techniques, and the "typical" plate tuning problem is like the typical piece of wood: a statistical entity rarely encountered in the real world. This is how Fig 1 must be interpreted - a statistical entity rarely encounted in real pieces of wood. This paper has been a long time coming and I apologise to the editor of the journal for taking so long to prepare it. Hopefully more will follow as I get more data. Research on plate tuning and other physical characteristics of musical instruments is extremely time consuming, and there is always more information that one would like to get. The ideal situation would be to make a large number of musical instruments with randomised physical characteristics and correlate these with the sound qualities of the finished instruments. This is completely impractical, and the sample of instruments is necessarily strongly biased because no one wants to waste their time making dud musical instruments just to prove a point. Biased samples are not well suited to scientific evaluation. Added to this is the difficulty of evaluating musical instruments consistently and objectively over a long period of time. Ideally one should have all the instruments in the same room, setup with the same strings etc, at the same time for subjective evaluation. But once again, this is completely impractical. Any form of objective measurement is also not practical because we don�t know what to measure in mandolins and don�t know what to look for as �good� characteristics because the research has not been done. Many experienced music instrument makers have already worked out how to make a fine sounding instrument through trial and error, learning from other instrument maker's experience, and application of educated guesswork (i.e. Intuition). Dan Bourgeois (2000), I believe, puts it very nicely - Voicing does not really control the tonality of a guitar. The range that you have (with voicing) is that it can either sound well balanced and have power or not. To manipulate the tone of the guitar, I would work with design elements. Change the woods. Change the bracing. Those are the big factors. Bourgeois (1994 and 2000) considers that voicing (i.e. Tap tuning) allows you to optimise the design. In my experience this principle is exactly the same in mandolins. The design elements are a little different because the dimensions are not as variable as a guitar, and graduations and arching are not relevant to flat top guitars, but the principles are exactly the same. Atwood, W (2000), Plate margins: the next frontier. CAS Journal Vol4 No1 pp 96-99. Bissinger, G. and Hutchins, C. M. (1985), Air-plate -> neck fingerboard coupling and the �feel� of a good violin. CAS Newsletter #44, reprinted in CAS Journal Vol 4 No 3 May 2001 pp 52-53. Bourgeois, D. (1990), Voicing the steel string guitar. American Lutherie #24. Bourgeois, D. (1994), Tapping tonewoods, How the selection of species helps define the sound of your guitar. Acoustic Guitar March/April 1994. Cohen, D and Rossing, T.D. 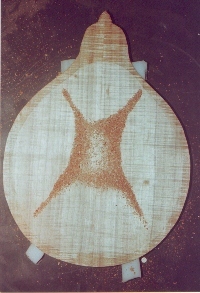 (2000), Normal modes of vibration in two mandolins. CAS Journal Vol 4 No 2 pp 48-54. Cohen, D and Rossing, T.D. 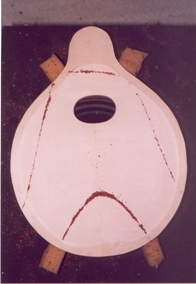 (2003), The acoustics of mandolins. Acoust. Sci. & Tech. 24, pp1-6. Coombe, P.E (1996). Use of Australian native timbers in mandolins. J. Aust. Assoc. Musical Instrument Makers 15, 6-11. Coombe, P.E. (1999). Use of Australian and imported timbers in mandolins II. J. Aust. Assoc. Musical Instrument Makers 18, 7-13. Coombe, P.E. (2003). A new Mandolin Bridge. J. Aust. Assoc. Musical Instrument Makers 22, 11-17. Hutchins, C. M. (1981), The acoustics of violin plates. Sci. Am. Oct 1981 pp 173-186. Hutchins, C. M (1982), Problems of moisture changes when tuning violin plates. CAS Newsleter #37, reprinted in CAS Journal Vol 4 No1 May 2000 pp 61-62. Hutchins, C. M (1983), Plate tuning for the violin maker. CAS Newsletter #39. Reprinted in CAS Journal Vol 4 No 1 May 2000. Hutchins, C. M. (1985), Effects of an air-body coupling on the tone and playing qualities of violins. CAS Newsletter #44, reprinted in CAS Journal Vol 4 No 3 May 2001 pp 47-51. Hutchins, C. M. (1990), Some of the effects of adjusting the A0 and the B0 modes of a violin to the same frequency. CAS Journal Vol 4 No3, Reprinted in CAS Journal Vol 4 No 3 May 2001. Hutchin, C. M. (1992), The future of violin research. CAS Journal Vol 2 No 1, Reprinted in CAS Journal Vol 4 No 1 May 2000. Schleske, M. (2000), Eigenmodes of vibration in the working process of a Violin. CAS Journal Vol 4 No1 pp 90-95. Thompson, R. (1979), The effect of variations in relative humidity on the frequency of response of free violin plates. CAS Newsletter #32, Reprinted in CAS Journal Vol 4 No 1 May 2000 pp 63-64. Wilkins, R.A. (2001), Violin mode relationships in free plates: After attachment to the ribs and in the finished instrument. CAS Journal Vol 4 No 4 pp 27-32.